Practicing these techniques is very important, as you will be using in in many songs later on. Keep in mind that the video teaches you the basic technique and how to implement it correctly, but practicing them is up to you. The old saying, "Practice Makes Perfect", is exponentially true for learning the guitar. Pick up your guitar whenever you have a chance and practice, this is the key to becoming good. Sorry, but you've reached a premium content area. The download of the Lead Guitar Lesson 2. – beginner guitar lesson #9 tablature file is only available to premium members. Sorry, the same goes for the backing track. To download the backing track to Lead Guitar Lesson 2. 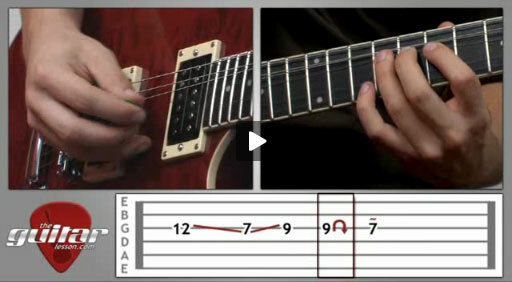 – beginner guitar lesson #9, please log in and revisit this page.